Wolfspell is on Kickstarter right now! Get this game of adventurers turned to wolves printed on a trifold album jacket! Still a work in progress, but a portent of things to come from artist Shel Kahn! If you aren’t a part of the Patron Horde, you may not know it yet, but the latest issue of Worlds Without Master includes my latest game: Wolfspell, a game about hard-bitten adventurers taking on a grim, perilous task that they can only accomplish by becoming puppies. I’m going to geek out about the dice in the game now, and if you’d like to read along at home, you can get issue two of Worlds Without Master right here. Wolfspell is something of an amalgamation of design elements from the two most important post-apocalyptic games of our day: Apocalypse World and MonkeyDome. But all of the innovation stolen from these two games pales, pales I tell you! What really matters is that I finally found an excuse to use the dice mechanic from the Time Lord roleplaying game. This is a die trick I’ve been admiring for-almost-ever: roll two six-sided dice and you subtract the lower die from the higher die. In Time Lord the result, which is a number from zero to five, is added to your ability to see if you succeed. Which has some cool effects, especially when you’re running a chase scene set in a classic Doctor Who tale. But what really interests me is the probabilities of the results. Check this out. Players are rolling two dice, subtracting the lower from the higher and adding the result to their character’s ability score, trying to achieve the highest result possible. A zero means the character performed at the baseline of their ability score. Not bad. They are performing as expected. But then again, if a zero got you to where you needed to be, why roll? You roll for that 83% of the time when you can do better than zero. And look at the reach there! You can be reasonably sure you can roll at least one higher than your baseline, maybe even two, but three? Surely not four or five, but they are so deliciously present, tempting you! I really dig the shape of this graph. But it’s not exactly how it works for Wolfspell, where there aren’t any Time Lord-style ability scores, and where the results are divvied both by which die is dominant such as in MonkeyDome and by an Apocalypse World-esque scale of Good, Bad and Ugly. So this is how it breaks down in Wolfspell. You identify one die as your Wolf Die to represent your wolfliness and the other your Blood Die to represent your humanliness. Roll. Note which is higher and then subtract the lower from the higher, getting a result of 0-5 that also tells you which nature (your wolf side or your blood side) is dominant for the roll. When the dice tie, the player chooses whether a roll of 0 is really a Wolf 1 or a Blood 1. A 1 result is the worst, the absolute worst. A 2-3 result is okay. But you’re really hoping for a 4 or more. When you start the game, you’re not very wolfy. 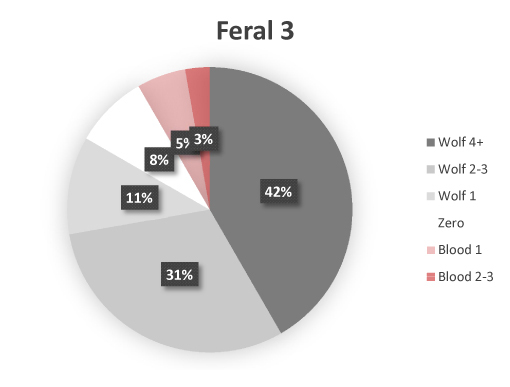 So you have a Feral 0, which means there’s no bonus to your Wolf Die. The above pie chart is your roll. Your wolf body is new to you and your wolf instincts are competing with your human experience and knowledge. So you only get a 4+ about 16% of the time, a 2-3 about 40% of the time, and 45% of the time you’re out of luck. But don’t worry, because you gain the benefit of experience. Most characters start the game with some way to add 3 to their Blood Die under certain conditions, like when hate and gore are involved or when the supernatural is present. Unlike Feral, you choose to add this after you roll the dice and see if it helps you or not. Generally speaking, that means only adding it if you’ve rolled less than a 4 Blood or if you’ve rolled 1 Wolf. Otherwise, you’ll just be hurting yourself. You can do it, if you want. I ain’t going to stop you. That chart looks like this. It will change as you gain more Feral, but the pattern’s the same. All your Blood results become Blood 4+ and your 0 and Wolf 1 results become Blood 2-3. Feeling better, aren’t you? Now half the time you’re getting a 4+ result and the other half the time you’re getting only a 2-3 result. No more of those pesky 1s. You’re also behaving humanly almost three-quarters of the time, but only when dealing with your specialization. The rest of the time you’ve got to rely on the standard roll, and you’re no fan of that. It’s time to embrace the wolf within. As you behave wolfy the game gives you opportunities to increase your Feral score (some of these are not optional). 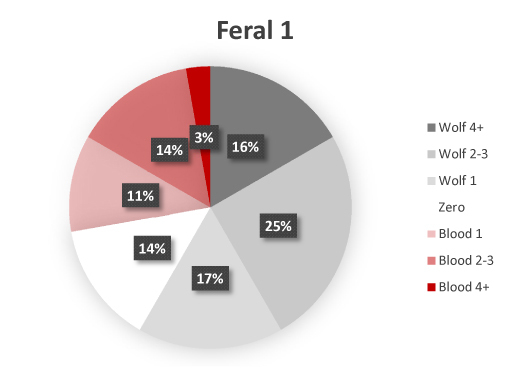 Let’s look at that basic roll for a Feral 1 wolf who adds 1 to the Wolf Die for every roll no matter what. You still roll a the measly 1 more than 40% of the time, but it’s slightly better than 45%. And your higher end is looking a little better at 19%. The trick is you are obviously getting more wolf results. Over half the time. If you swing your zeroes human-wise, you only have a 42% chance of rolling human. That may be important towards the end of the game. 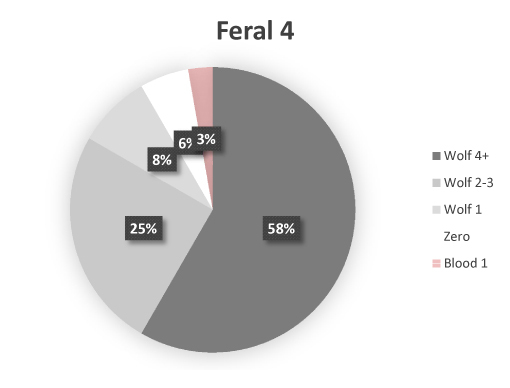 So a Feral of 1 takes 3 percentage points off the low end, where they won’t be missed, and slaps them on the high end, where they will be more appreciated, all at the cost of being slightly more lupine. An all around smart move. But let’s throw caution to the wind and kick that Feral up one more. Now you only get a 1 result a third of the time. Go you! And you have a whopping 28% chance of a 4+. But that 4+ is now all wolf. The best your human side can hope for is a 2-3. You’ve moved 9 percentage points off the low end and onto the high end at great cost to your humanity. Still, when you really need to, you can act human over a 25% of the time. 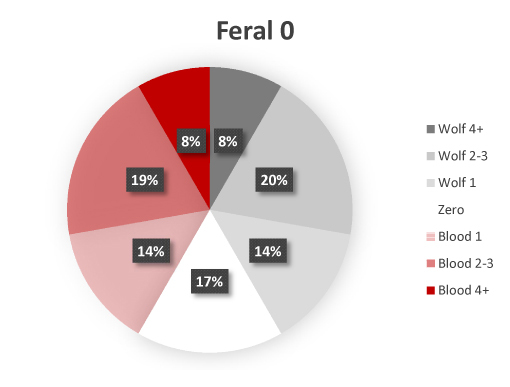 Let’s see if we can’t fix that with one more Feral. Well, well, well, what big teeth you have! The 1 result shows up less than 25% of the time. And you have a 4+ result 42% of the time! You’re forgetting what it’s like to be human. 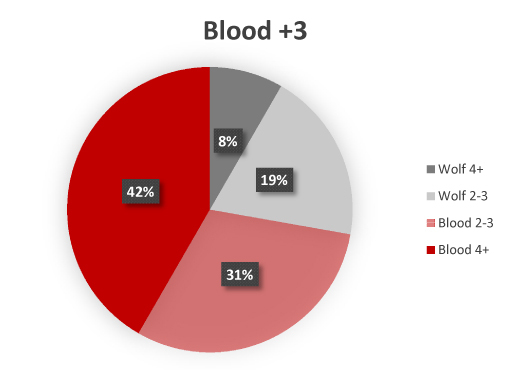 Your +3 Blood bonus is still helpful 27% of the time, and it can help you get that elusive Blood 4+ result. So that’s good. But it’s still not looking good for the person you used to be. 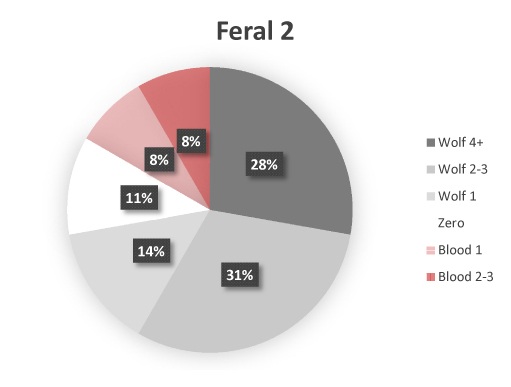 At this point in the game, getting a higher Feral should start to become more difficult, but still possible. 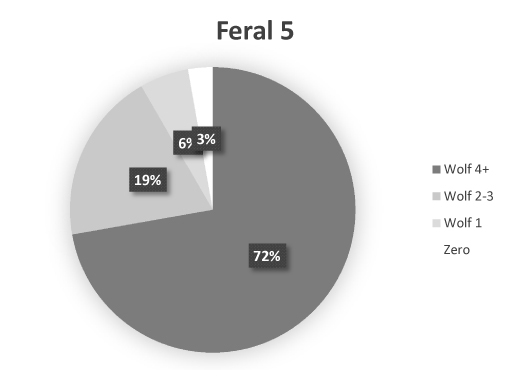 So, because it’s fun, let’s take it all the way out to Feral 5. Look at those jumps! Feral 4 and 5 wolves are badass! And they better be, because they’re going to spend a long, long time as wolves. I really don’t have anything insightful to say about these charts. In truth, they tell us exactly nothing about the experience of play. But I still can’t help loving them. That jump when Feral goes from 2 to 3 and the perilous slope towards eternal wolfdom that follows! I just love them. Pingback: Some Traditions Even the Lords of Chaos Must Keep | Happy Epimas! Hey Eppy! I disagree with your third to last statement! I’ll admit I haven’t read Wolfspell yet – but from what I can see here, it puts players in a really perilous place: If they want to succeed, if they want to be awesome, they have to go towards their wolfy side. So they’ll want to advance… but that also means losing contact with their human side. I think it sounds like an interesting way to force players to choose whether to sacrifice their mission or themselves. Thanks for explaining the die mechanic in detail. I’m here because I’ve heard Vincent Baker’s praise of Wolfspell on a podcast. Haven’t checked out the game yet. Just wanted to mention that the dice mechanic you’ve used is maybe not that far off from the nowadays quite popular FATE/FUDGE dice mechanic (which is very close to d6-d6). On the FATE/FUDGE dice, you could call the + “blood”, the – “wolf” and get very similar results, I believe. Still, need to check out your game, of course! Lowest die is the right number and color. Doubles are zeros. That’s it. This is much easier than constantly subtracting and yields the same probability curve. That is so effortlessly cool in how it drops the mental load and streamlines the roll! Bravo!